It was a very mixed month for world equity markets, with net monthly changes ranging from +2.4% (China), 1.6% (USA - Dow), +0.3% (Brazil), -2.8% (UK), to -4.6% (Russia). Near term outlook is bearish, but the mid term outlook remains bullish, not least if commodity prices can pick up in the second half. The mighty Dow settled higher for a third consecutive month, with a net June gain of 340pts (1.6%) to 21349, and a notable new historic high of 21535. Underlying MACD (green bar histogram) remains strongly positive, if a touch below the April high. 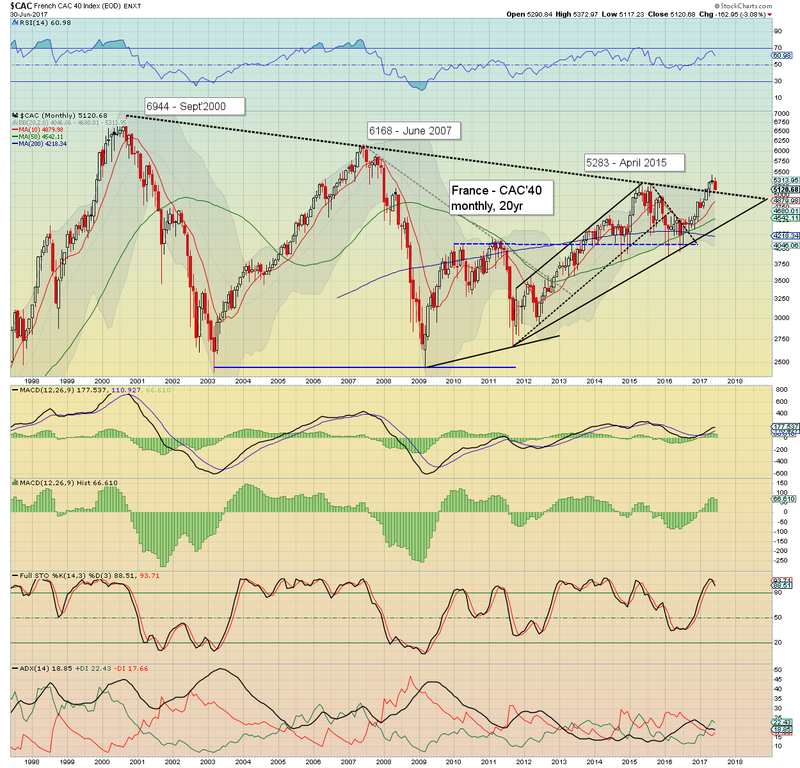 The key 10MA is at 19997, and will be in the 20100/200s at the July 3rd open. 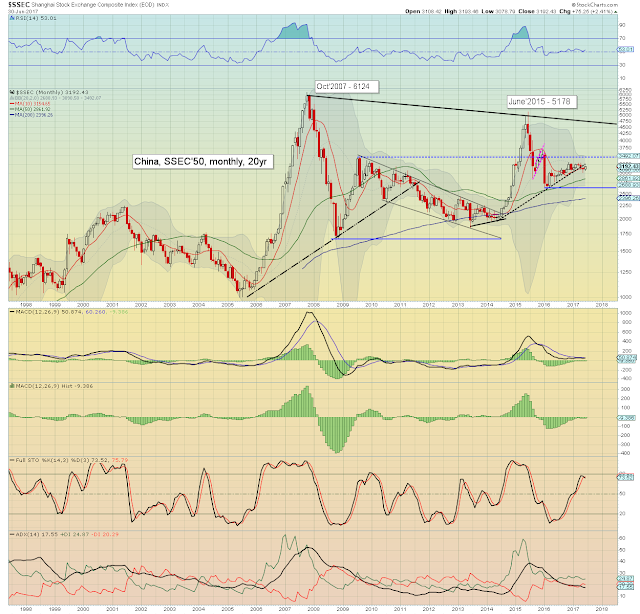 Best guess: near term weakness of 2-3%, but nothing close to core rising trend - which in mid July will be around 20500. New historic highs look probable in Aug/early September. 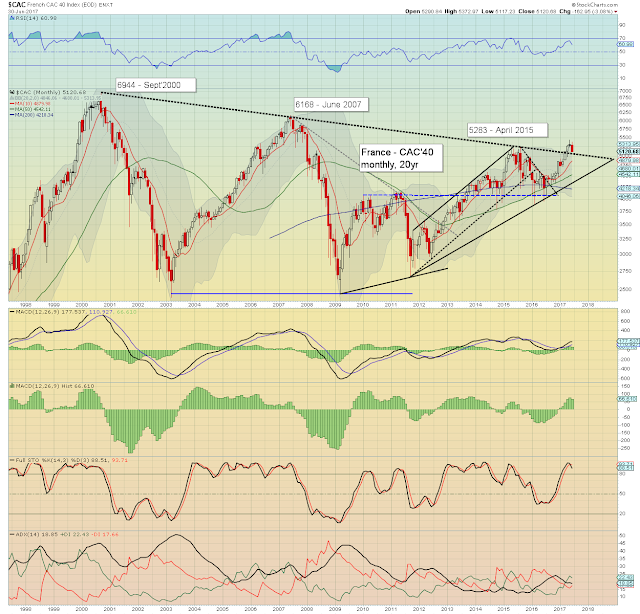 A year end close around 22750/23250 is viable, not least if the fed raise rates at least once more. 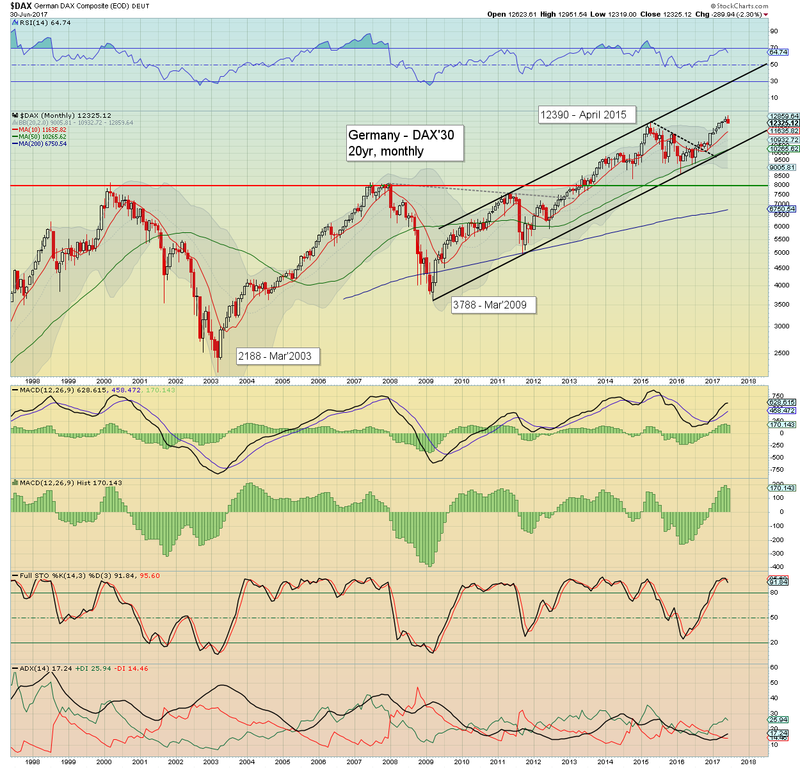 Equity bears should be desperate for a monthly close under 20k, but that is currently a clear 6% lower, and looks very unlikely this summer. Instead, there will be a better chance in late Sept/Oct', which is typically a 'delicate' period for the US market. The economic powerhouse of the EU - Germany, saw the DAX break a new historic high of 12951, but having leaned distinctly weak into end month, settling -289pts (2.3%) at 12325, the first monthly decline of the year. 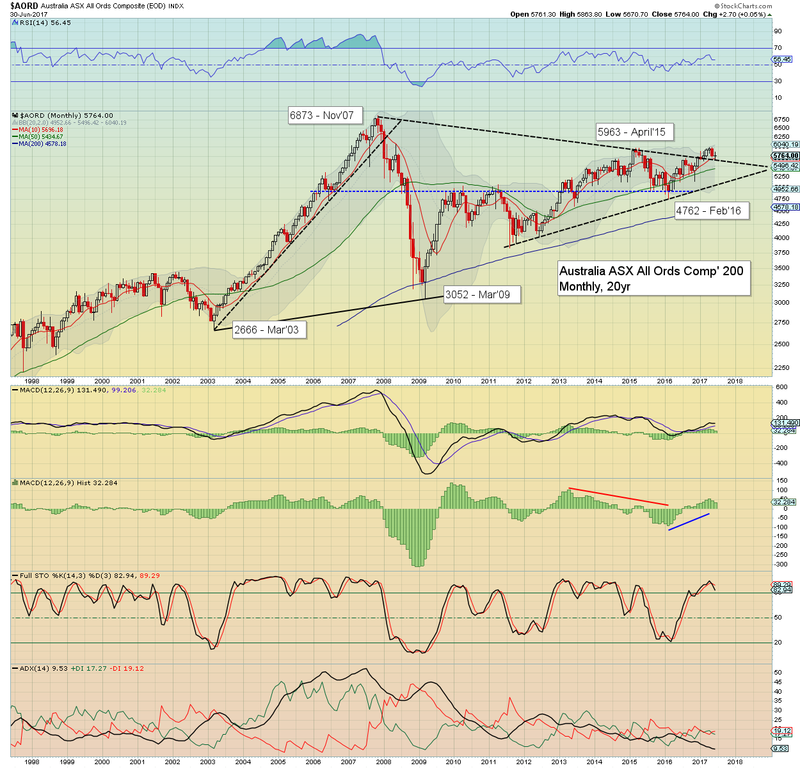 Underlying MACD is rolling over, but at the current rate, a bearish cross is out of range until at least October. 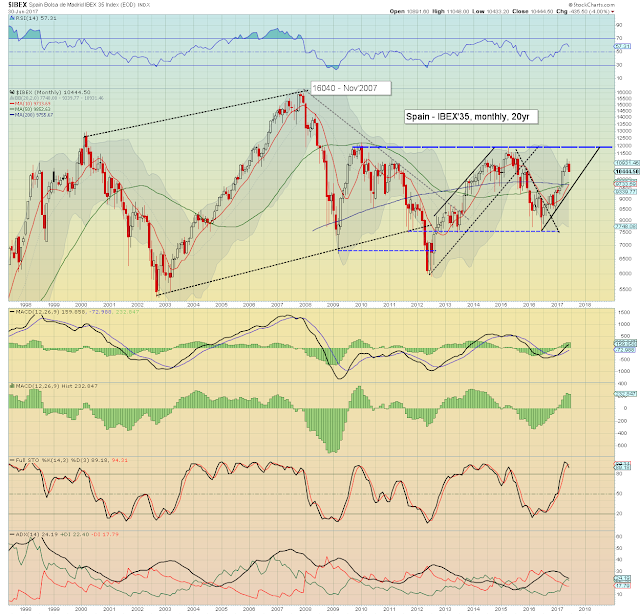 Those who believe in the 'five waves from 2009' theory, could notably highlight a divergence in the MACD, with a lower momentum high (see black MACD line) in May, vs the high in spring 2015. Equity bears should be seeking a monthly close under the 10MA, which in July will be around 11900, and might have leveled out in August around 12k. Its something to watch this summer. The BoJ fuelled Japanese market settled higher for a third consecutive month, +382pts (1.9%) to 20033, the first monthly close >20k since July 2015. 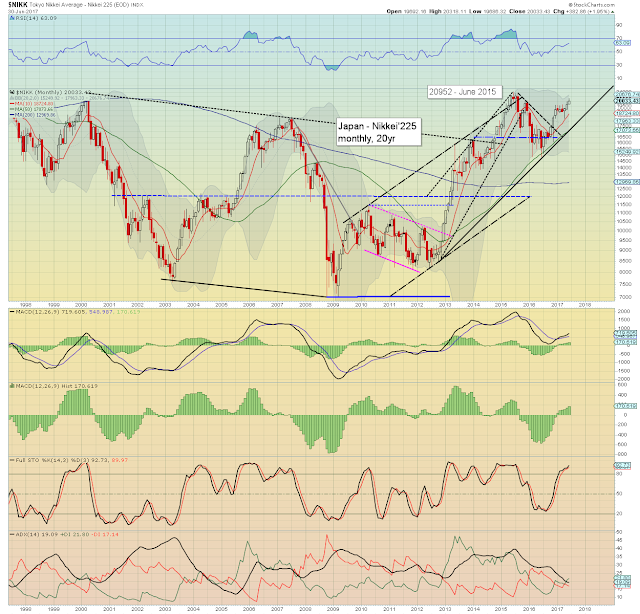 Next soft upside target is the June 2015 high of 20952. 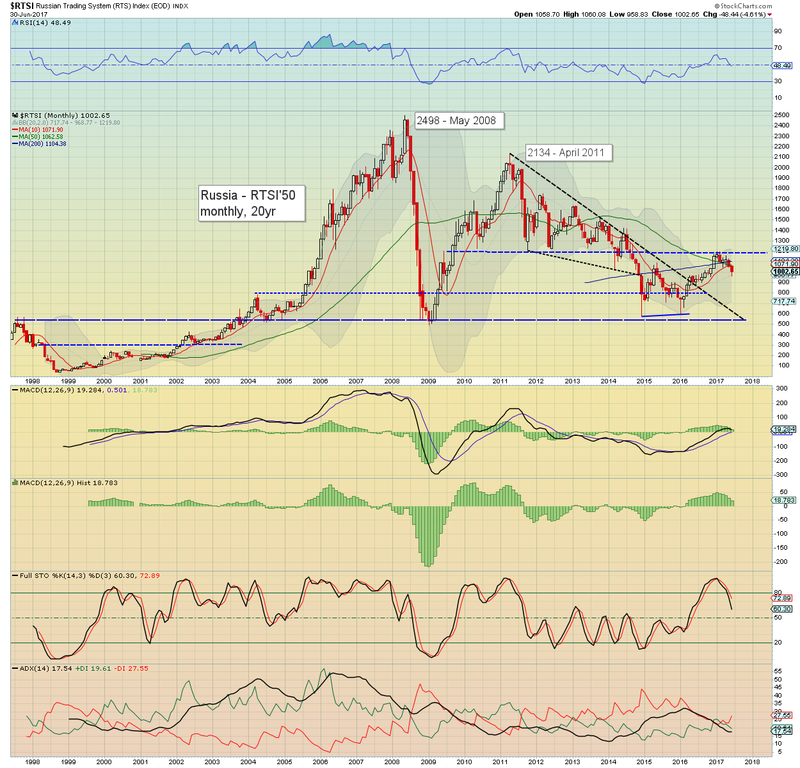 Any price action >21k will offer the 1996 high of 22750. After three months of declines, the Chinese equity market has finally posted a net monthly gain, settling +75pts (2.4%) at 3192. Price action since Nov'2016 has been broadly choppy. Underlying MACD is threatening a bullish cross in July. 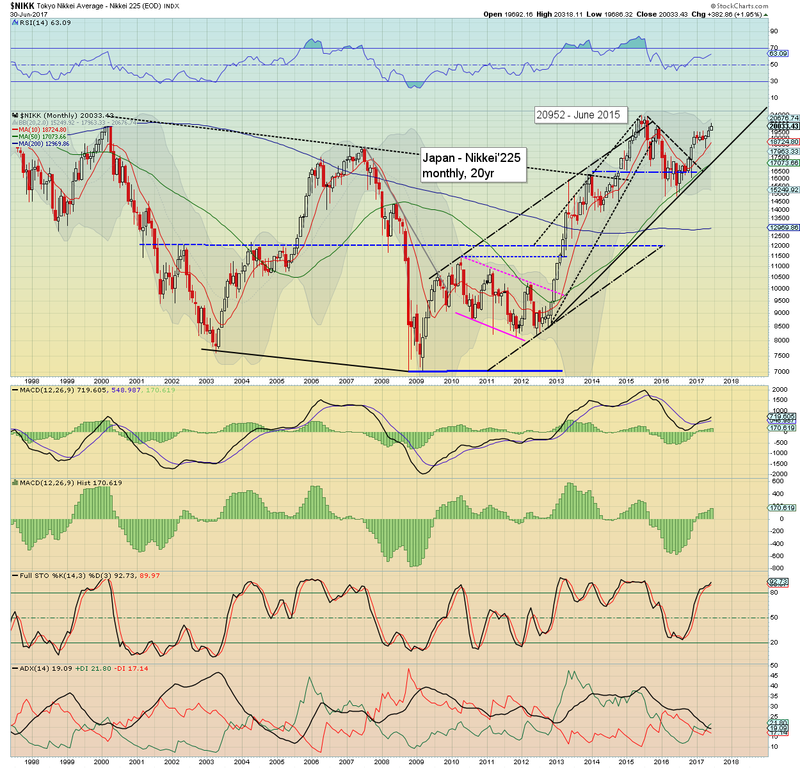 In theory, that offers accelerated upside, with an initial target of the Nov'2016 high of 3301. Upper bollinger is offering the 3475/500 zone by September. 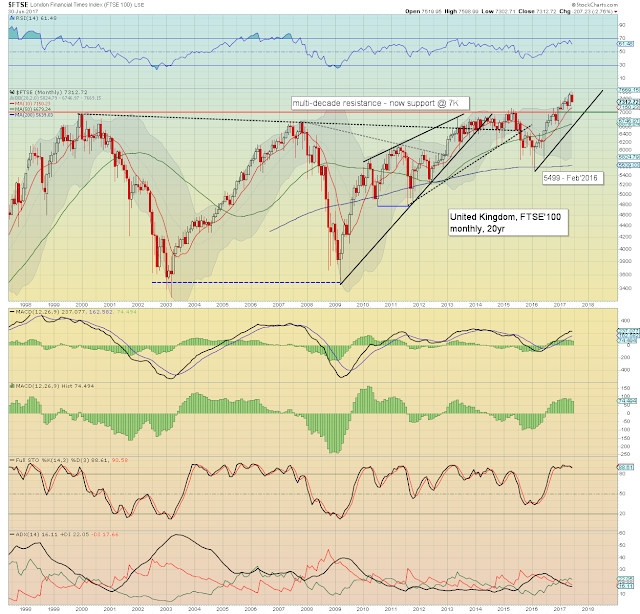 The June 2015 high of 5178 looks out of range before year end. 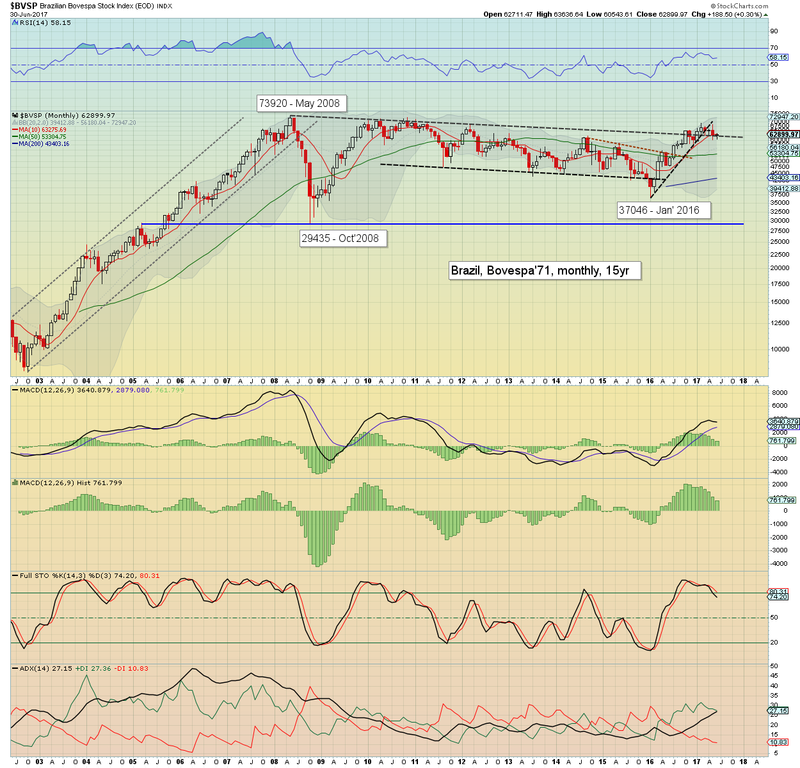 The Brazilian market is battling to stabilise after a difficult four months, settling +188pts (0.3%) at 62899. Near term is still somewhat shaky, not least as commodity prices remain broadly weak. Price momentum continues to weaken, although a bearish cross will be averted if commodities can start to recover in Q3. 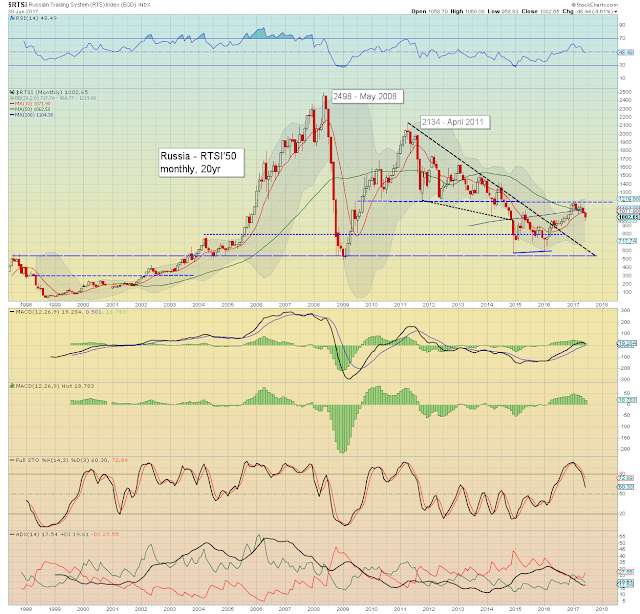 A challenge of the May 2008 high of 73920 still looks probable within 6-12mths, despite rather regular political scandals. Its been a rough year so far for Russian equities, having cooled from a Feb' high of 1196, and settling June -48pts (4.6%) at 1002. Weak commodity prices - especially within energy, are dragging the RTSI lower. Things will turn bullish again on a break above the key 10MA, currently in the 1070s.. some 7% higher. An eventual break >1200 still looks probable, and that will offer grander upside to at least the 1500/1700 zone, but not until next year. The UK saw a mixed month, breaking a new historic high of 7598, but settling -207pts (2.8%) at 7312. The election result of a 'hung parliament' is not exactly inspiring confidence. The key 10MA is 7150, with core support at the giant 7k threshold. No price action <7k is expected within the near or long term. Indeed, if you accept that old resistance is now support, broader upside to at least the giant 10k threshold is due in 2018. The wild card to the bullish UK scenario is that another election within 3-12 months is a near certainty. Considering the national mood, the Labour party have a serious chance to build support and achieve an outright victory. Corbyn is absolutely someone the capital market fears. I'd imagine those at the BoE are no fans of him either! The CAC saw a black-fail candle in May, and it even had a spiky top, indicative of short term exhaustion. June confirmed things, with a net decline of -162pts (3.1%) at 5120. 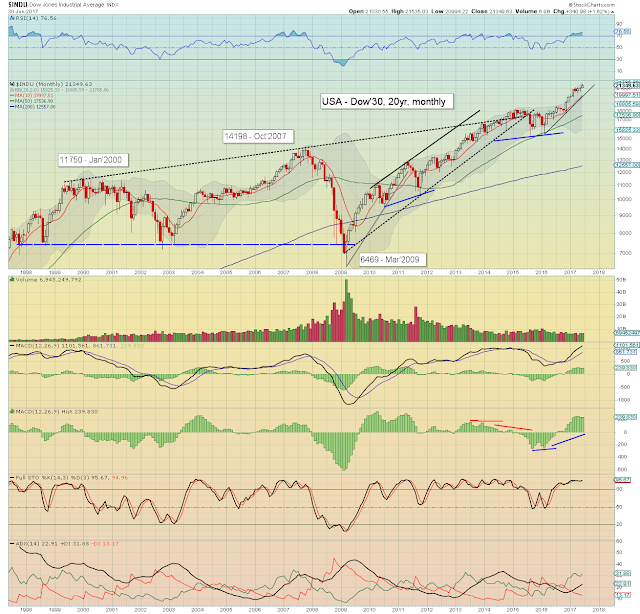 First soft support is the 5k threshold, with the 10MA set to be in the 4900s in early July. Rhere is viable near term downside of around 4%, without doing any technical damage to the mid term bullish trend from early 2016. The Spanish market had a difficult month, settling -435pts (4.0%) to 10444, the most significant decline since Nov'2016. Near term outlook is bearish, but the bulls can sustain downside of around 4% without breaking multiple aspects of support, including the giant psy' level of 10k. Mid term outlook is still bullish, with first big target of multi-year resistance of 12k. 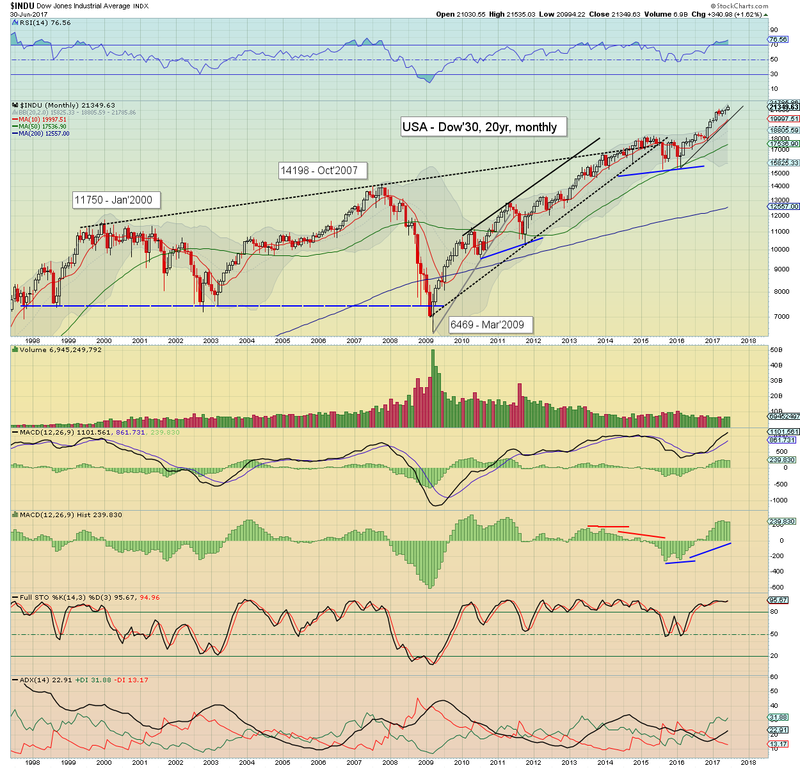 Any monthly close >12k will offer (at least) another 3000pts (25%) higher to 15k. The Australian market saw a month of chop, settling +2pts (0.1%) to 5764. It could be argued the market is just back-testing the old declining resistance/trend. Broadly, further upside does seem due, to challenge the Nov'2007 historic high of 6873, which is another 19% higher. The Australian market is highly dependent upon commodity prices, which have been very depressed lately. Any swing upward in commodities is going to significantly boost the ASX comp'. A very mixed month for world equity markets, with notable weakness in Europe. 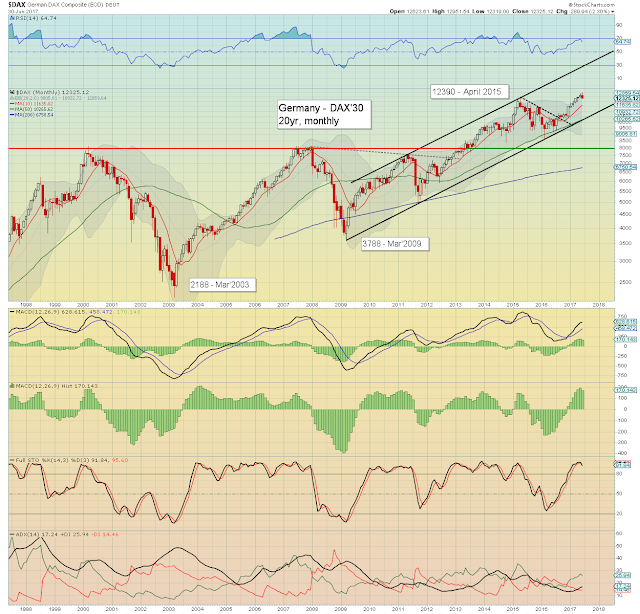 The US and German markets continue to regularly break new historic highs. Commodity centric markets - such as Brazil and Russia, are being pinned back. Most markets have downside buffer of 4-5% before mid term rising trend/support is tested. It will be a very compressed trading week, effectively just 3.5 trading days. Most days (normally around 7pm EST) I highlight a broad variety of individual stocks, especially tech, industrials, miners, and financials. As ever... follow and retweet. *the next post on this page will likely appear 6pm EST on Wednesday July 5th. I'll only appear late Monday if there is 'any drama'.